Two for the Price of Four, a photo by timtak on Flickr. The Japanese word mottainai meaning "it's a shame when you waste something," (Mollman, 2001) was made famous by the late Kenyan Environmentalist, Wangari Maathai, Nobel Peace Prize winner. At first I was sceptical since the meaning of mottainai seemed almost identical to that of the common English word, "wasteful." But upon reflection, it seems to me that Japanese do have a greater sense of waste, or a greater, perhaps animistic sense of involvement with the things that they might otherwise waste. Mollman (2001) argues that mottainai fuels the Japanese obsession with converged electrical gimmicks e.g. where a radio is merged with a dynamo, solar panel and torch, or a television with a radio cassette player, since to do otherwise would be a waste of space. I think that Japanese people feel a sort of sympathy for things themselves, and reuse paper since to do otherwise would be a very mild form of homicide. This animistic origin to the heightened sense of wastefulness, may explain the emphasis upon recycling rather than reusing in Japan. The Japanese do not believe in reincarnation or heaven but that the soul merges with the gods and is born again as other people. Pieces of paper merge with the pulp and are repressed into other pages. As previously mentioned the grief of mottainai may also explain the relative absence of BOGOF (Buy One Get One Free) marketing in Japanese stores. It may also be a factor in the pricing in of the batteries in the above photo. 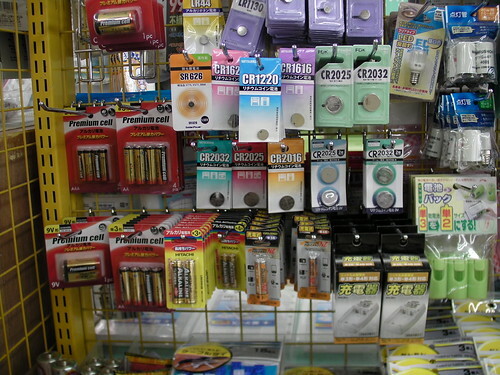 This one hundred yen store's products are all 100 yen, and include packs of both 4 AA batteries, and 2 AA batteries at the same price. Admittedly, the 2 pack of batteries carry the name of a Japanese manufacturer (Hitachi), whereas the 4 pack batteries are generic "Premium Cell", but it seems to me unlikely that consumers believe that the Japanese branded batteries last twice as long as their OEM counterparts. I suggest rather than Japanese consumers purchase two batteries when they need to batteries, since to purchase four would feel mottainai. They might not use the other two. They would go to waste. Bearing this in mind it is surprising that Westerners, even as they roll through their malls on buggies since they can no longer support their own weight, do not feel mottainai when offered a BOGOF deal. Where did our sense of "shame when you waste something" disappear? What is it about the corporeal - things, the body - that does not deserve our respect? The 'Nacalian' theory provided by this blog provides only part of the answer. It is here argued that while verbal and visual self-representations are essential for the genesis of self, Westerners identify with the former, and Japanese with the latter. Identifying as they do with the visual, they are more sensitive to the destruction of little pieces of 'extensia' - things. But I don't think that this theory goes far enough. It seems to me that the BOGOF buyer almost has it in for the extras pieces of corporealism that he purchases. There is a potlach of free pizza, puddings and pints of milk, and at time an almost gratuitous disrespect of the body. Take that, pizza, into the bin you go! Take that, body, another pizza for you! This disrespect is alas I fear mirrored in the Japanese feeling towards narratives, theories and reason. They rise and fall in oblivion's host, items of fashion, soon forgotten, unlike a synthetic face. Hello Kitty is forty years old. Abenomics will be lucky if it is remembered in four years time. No-one reads Shinto mythology and comparatively very Japanese people read (non-comic) books. There is even a word to decry reason "rikutsu." The closest English translation is perhaps humbug. Rikustu, or the phrase "Rikutsu iu na" (don't say any more humbug) is use to silence those that attempt to be too rational, or wordy than is felt necessary. Words are extraneous, faddish, and abbreviated everywhere from haiku to pasokon and sefure. Indeed, English words are often used on T-shirts, in mottos and names for products, even though or because most Japanese can not understand English. English, and still more so English, allows the Japanese to reduce words to their beloved phenomenon: sounds and above all images. But this still isn't answering the question. What is it that we logocentrist word-lovers have against corporeality, and what is that corpo-animistic thing-loving Japanese, have against the opposite side? What is in that word-lovers have against "narcissism" which originates and rotates about a loving self-phenomena? What is it that the Japanese hate about verbal arrogance, or even self-expression, even as they prune themselves so perfectly? I have plausible answer to this, related to my recent post on Pokemon, but I have written too much, to myself. Queasy.